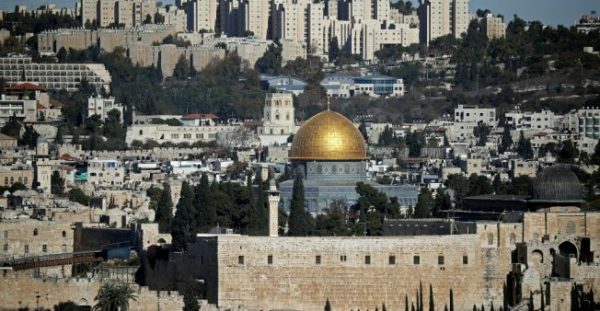 Trump’s Jerusalem move triggered many evangelicals’ anxieties about the apocalypse. A general view of the city of Jerusalem shows the Dome of the Rock mosque (C) on December 4, 2017. A deluge of news in recent weeks, including the contentious election involving evangelical judge Roy Moore and President Donald Trump’s decision to move the US embassy to Jerusalem has quite a few evangelicals on edge. Many are taking to Twitter to process their thoughts through the hashtag #RaptureAnxiety, which explores the many ways in which evangelicals have experienced anxiety or trauma around narratives of the “rapture.” An anxiety that includes other harbingers of the “end times” associated with a particular strain of American evangelical Christianity, and that — for many — has been compounded by some of the last week’s political events. Certain strains of evangelical thought that many members of the mainstream media have long dismissed have come to the fore. Both Trump’s decision to move the embassy to Jerusalem — a city central to some American evangelical apocalyptic narratives — and the resurgence in popularity of Moore, a Christian theocrat who has been accused of sexual misconduct with several teenage girls, have made apparent that the “fringe” has entered the political and theological mainstream. #RaptureAnxiety, like #ChurchToo (by which people shared stories of sexual harassment at church) and #EmptythePews (which critiqued hypocrisy in the evangelical community) before it, seeks to amplify the voices of those affected by the waves rocking the evangelical community. Many Americans are aware of the concept of the rapture — a time when, according to some evangelical traditions, believing Christians will be suddenly and unexpectedly “raptured” up to heaven before the events that presage the end of the world. In most accounts of the rapture, believers go straight to heaven, while nonbelievers are left behind to undergo a period of political chaos and personal torment. One contributor to the hashtag recalls that the anticipation of the rapture led some people in her community to max out their credit cards, believing that the rapture would come before payment was due. Another recalls the terror she felt when her parents forgot to pick her up from a junior high school soccer practice and she became convinced that they had been raptured, leaving her behind to face tribulations alone. The writer D.L. Mayfield recalls how she never made college plans, as she was convinced the rapture would come before she turned 16. Christian traditions have varying understandings of the end of the world, rooted in different interpretations of the Bible (in particular, the book of Revelation). The narratives around the “end times” and the “rapture” are largely an American phenomenon. While early Christianity was intensely focused on eschatology (i.e., the study of the end of the world), the “end times” theology as we know it today is fairly recent. It began in England, among Puritan preachers in the 18th century such as Increase and Cotton Mather, who preached the notion of a “rapture” in which believers would be brought to Jesus before a period of “tribulation” and turmoil on earth, resulting in Jesus’s Second Coming. The rapture concept then started to proliferate in America after the Civil War, through the efforts of figures like John Nelson Darby, who referred to it as Dispensationalism. The idea of “Dispensationalism” is based on the idea that history is divided into different “dispensations,” or epochs. Different groups of Dispensationalists had different interpretations of exactly how many of these there were, but major epochs included the Law (the period between Moses and Christ), the period of Grace (Christ’s coming until the modern day), and, finally, the Kingdom, the epoch before the end of the world. That would begin with the rapture, continue through a period of turmoil and chaos — usually thought to be one millennium — ending with the Second Coming of Christ. Central to Darby’s theology was the idea that the end of days would also include a fulfillment of the Old Testament promise to the Jewish people that Jerusalem would be restored to them. While subsequent dispensationalist preachers have differed on whether this happens before or after the rapture, in practice it means that Jerusalem is a vital part of many evangelicals’ narrative: The restoration of Jerusalem to the Jewish people is part of the sequence of events that heralds the end times. That’s why Trump’s controversial decision last week to declare Jerusalem the capital of Israel was so important to many members of the religious right. Today, versions of this theology are extremely common in American evangelical thought. Up to 65 percent of evangelicals identify with “Premillennial Dispensationalist” theology (i.e., the belief that the rapture precedes 1000 years of tribulation) — a strikingly high number given how recent, and how specific to American evangelicalism, this theology is. (As a rule, mainline Protestants do not subscribe to Premillennial Dispensationalism). Books like the Left Behind series (which were made into a film with Nicolas Cage) have seeped into the wider evangelical consciousness, casting the “end times” as a high-octane action film, in which the good are rewarded and the evil (or, at least, unbelieving) punished. One of the many narratives that #RaptureAnxiety highlights is how political that theology is — and not just in terms of views on Jerusalem. Foreign affairs are often seen by evangelicals through an apocalyptic or eschatological lens, such that they are not worrying but rather welcome signs than the desired “rapture” (which is great for believing Christians, albeit bad for everyone else). But in today’s political climate, these attitudes are particularly striking. Often, evangelicals identify pan-governmental or “globalist” political entities with the Antichrist, a figure of evil believed to rise to power during the tribulation that follows the rapture. In the 1972 evangelical film A Thief in the Night, for example — a film many #RaptureAnxiety contributors cite as enormously influential on their childhood — the Antichrist is literally a branch of the United Nations claiming control over the entire world. Likewise, in the Left Behind books, the Antichrist is the leader of a one world government known as the “Global Community,” a seemingly peaceful equivalent to the United Nations that turns out to (once again) be in league with Satan. Understanding the link between “globalist” organizations and the Antichrist in evangelical thought is vital for understanding the evangelical lens through which current affairs are viewed. Big government, international co-operation, and organizations like the United Nations are inherently suspicious (something that makes evangelicals particular primed to the conspiracy theories of say, Alex Jones). International turmoil (particularly involving Jerusalem), war, and chaos are inherently positive, because they suggest the rapture is nigh. This brings us to Roy Moore, and how his consistent evangelical support is helping him potentially eke out an advantage in the latest polls in advance of Tuesday’s special election. Now, Roy Moore is associated with a different, though no less politically loaded school of thought: Christian Reconstructionism (often used interchangeably with Dominionism), which believes in a global theocracy governed by Mosaic Law. Many Reconstructionists are not premillennialists but rather postmillennialists, believing that the Second Coming will only occur after 1000 years of Christian rule on earth, and therefore that they should focus their energy on bringing Christianity into the political sphere, rather than anticipating an imminent rapture. That said, for many of Moore’s supporters, most of whom — like most evangelicals — subscribe to premillennialism, his story hits familiar evangelical beats. To them, “big government” — the establishment — has conspired to seemingly falsely smear an innocent man seeking to build a Christian kingdom on earth. “[the] ‘end-time transfer of wealth’ will relieve Christians of all financial woes, allowing true believers to ascend to a position of political and cultural power in which they can build a Christian civilization. When this Christian nation is in place (or back in place), Jesus will return. Whether or not the rapture is imminent for Moore the way it was for, say, Darby, the idea of the end times is central to his supporters’ narrative. He is doing all the “Right Things” to bring Jesus back, and the “mainstream media” and its globalist adherents are getting in his way for their own, presumably diabolical ends. And premillennial and postmillennial views of the rapture alike prioritize the “end of days” — and its impact on Christian believers — over the political realities of the here and now. As the Alabama special election comes and goes, it’s worth remembering that, for many voters, this isn’t just an election about two men. It’s a battle over good and evil for the end of the world. Apocalypse?? Apocalypse!! Let it come. Considering that Jews killed all the rightful Prophets, and plagiarized the bible to adulter the scriptures deforming the reality to favour and serve their cause of stealing and choose and be the chosen ones. The fact that the Christian church had infiltration from Jews to demonize what they wrongly call a Judeo-Christian Religion, when in reality the Religion that Jesus gave to humankind is unique and original and against the Jewish old testament and their ghetto of garbage. this movement of stealing Jerusalem who in turn was Galilean Phoenician City in ancient times and than suffered the greed of UK and the Jews of Europe has now fallen in the hands of evil, most certainly will have repercussions during time, but nobody knows now what kind of consequences until they happen. Editors 700 hundred years later. Very sad. The Embassy of Guatemala operates on the territory of the technological complex “Malcha” in the Israeli capital.